I wore a Cardinals shirt yesterday. The fact I had the day off work made that an easy choice. Given it was the three-year anniversary of Game Six of the 2011 World Series, I decided on my Lance Berkman shirt. Yet what really mattered was the emblem on the front, the Cards’ familiar birds-on-the-bat logo. The Cardinals attire was to honor Oscar Taveras, of course. He’s been on my mind so much since Sunday night, when I saw the first tweets about the car accident that claimed his life and hoped the news was some cruel social media death hoax. When I saw a tweet from Bob Nightengale of USA Today, I knew it was true — and the World Series game I’d been watching was forgotten. I continued scanning through Twitter as more and more outlets confirmed the shocking, senseless, heartbreaking accident that killed both Oscar and his girlfriend, Edilia Arvelo. Obviously heartbreaking. Any deaths of a 22-year-old and 18-year-old are. Young lives ended so much too soon. Such promise left unfulfilled. And, regrettably, familiar emotions that follow the shock for all of us as Cardinals fans. As we are all very well aware, this is the third death of an active Cardinals player since 2002. We each have our own way of dealing with the loss of Oscar, just as we each had our own way of dealing with the loss of Darryl Kile on June 22, 2002, and Josh Hancock on April 29, 2007. It’s an odd situation too, and not one that time or repetition helps change. As fans, we have a connection to the players on our team. We root for their success, we are disappointed when they disappoint, yet in reality we are detached from them. Sure, we may see them in person or get an autograph and have a short conversation. But we don’t really know them. We’re not their family; we’re not their friends; most of the time we are watching them on a television screen as they play a game for our entertainment, though occasionally we are in a ballpark to watch them perform in front of us. 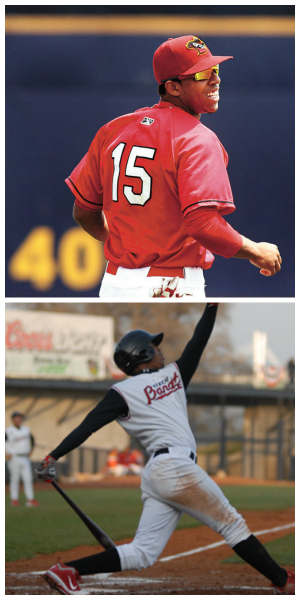 I had the chance to see Oscar quite a few times in 2011 when he was on the Quad Cities River Bandits. They won the Midwest League championship that year, sweeping their way through the playoffs, and Oscar was the Midwest League batting champ even though he was on the disabled list a couple of times during the season. That Bandits team was such a fun one to watch. Trevor Rosenthal was here then, as a starter, as was Kolten Wong once he signed following the June draft. 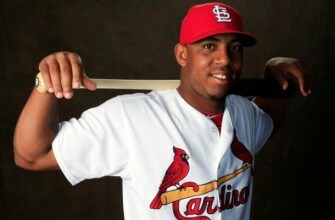 And Oscar, already a heralded prospect with that swing and that smile. Those recollections made reading this article on Oscar’s death from my local Quad City Times so bittersweet. Yesterday, wearing my Cardinals shirt as I ran errands and took advantage of the early voting for next week’s election, my attire was noticed. A stranger at the grocery store nodded and smiled. The woman who checked me in at the polling place asked if I’d heard about the Cardinals player who was killed and said it was so sad. The woman next to her did not know, so I explained it briefly and mentioned he’d played here in the Quad Cities. The polling place was surprisingly crowded, so I had to wait for a voting machine to open. When it did, the 60-ish man who was explaining the new touchscreen machines to each voter ran through his much-practiced spiel quickly for me and then said, “Taveras was here in 2011. I saw him play a lot then, and have been a Cardinals fan since I was 9 years old. But this just hurts.” I nodded, saying I too was a long-time fan, had watched Oscar here and agreed about the hurt. “Such a shame,” he said softly as he walked away to help the next voter. When I finished voting, he was again helping another voter yet glanced my way. I waved and he did the same. The loss of Oscar baseball-wise is definitely wide-reaching, not just among Cardinals fandom or his teammates and Mike Matheny and John Mozeliak and Cards staff. It affects those who played against him, as the number of social media posts from current players demonstrates. It affects his MLB friends also from the Dominican Republic, especially those still in the World Series like the Giants Juan Perez and the Royals starter tonight, Yordano Ventura. It affects those who cover the team, locally in St. Louis and nationally, as Ken Rosenthal — who broke the news during the World Series broadcast — poignantly wrote about. It will take time to heal, especially with Oscar’s death coming so soon after the Cardinals season ended. The wounds will become fresh again in February, when spring training begins, and once more when the regular season — and the home opener — occur. Yet nothing will change what’s happened, nothing will make the loss everyone — and especially his family and friends feel now and in the days ahead — go away. We all just have memories now. For us as Cardinals fans, it’s that magical first homer amid the raindrops and his final, dramatic blast during the NLCS. That powerful swing we’ll never forget. We once again realize just how short life can be. And we learn again to appreciate the moments while they happen. Because we never know when they’ll be the last. Chris, thank you so much for this. You’ve got unique memories of Oscar, and I wish so much I could have watched some of that 2011 team. While we all remember the debut of Minor League Guy May 31 against the Giants and his home run that opened the skies, I have my little memory, too. I’ll remember Oscar absolutely socking a home run for Memphis in a blow-out loss to Omaha this past April, a shot so hard into the teeth of a 25-mph wind coming in from right at Warner Park, so hard that the grass crying out in pain when it hit the berm beyond the fence could be heard from where I was sitting. I know you don’t like The Best Fans in Baseball(TM) tag we all get from the media. I’d say we’re not the Best Fans in Baseball, I think we’re the Best Family in Baseball. Yeah, I guess we are. Because we get to share our family history, like we’re gathering around the dinner table, but with people we’ve never met before. Sometimes that history is wonderful. Tales of Hornsby. Dizzy Dean. The Man. Enos. Gibson. Brock. Simmons. Hernandez. 1982. 2006. Freese. And sometimes the memories are painful. 1968. Denkinger. Ankiel. Kile. And Minor League Guy. But memories of Minor League Guy are all we have now. But you know something? Twenty years from now we’ll still be talking about Oscar the Violent. Because in his brief time playing ball for us, he made enough memories for us to talk about for a lifetime. And for that, at least, I’m grateful for the time we did get. Well said. Oscar did provide tremendous memories in those months he was a big league Cardinal, ones we will definitely remember — just like we’ll remember that smile. And it’s still seems so strange to think he’s no longer here.